Jesus-Islam » Jesus Christ » Who is this Jesus? A prophet or more than a prophet? If Jesus asked you today: “Who do you say I am? What would your personal response be? Perhaps you would reply that he is a great teacher, a great prophet. Jesus asked his disciples the same question: “Who do they say I am, the Son of man? (Matthew 16:13). The disciples replied, “Some say you are John the Baptist, others Elias, others Jeremiah, or one of the prophets “(Matthew 16:14). Today, as yesterday, there are those who see Jesus as a mere teacher or a prophet. Again Jesus asked his disciples, “And you, who do you say that I am? (Matthew 16:15). To this the Apostle Peter replied, “You are the Christ, the Son of the living God” (Matthew 16:16). It is as if Peter said, “It is true that people say you are a prophet, but for me you are much more than a prophet. You are the Son of God!” The answer of Jesus to Peter is of the utmost importance: “You are happy, Simon, son of Jonah; For it is not flesh and the blood that has revealed it to you, but it is my Father which is in heaven “(Matthew 16:17). 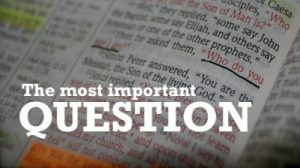 Was Jesus a prophet? Certainly! Was he merely or only a prophet? No! Peter here confesses that he is convinced that Jesus is more than a prophet. The Bible teems with evidence that Jesus is both Man and God. Throughout his life, he proved this by infinite attributes and His display of characteristics which are exclusively God’s. He alone reveals to us the true nature of God. He spoke and acted as only God can. He took to Himself the divine name. He can forgive sins and transform lives. He is One with God in perfect unity. He can do anything and everything, He knows all things, He is just and right. He is the only one to have lived without sin. The Koran bears witness to His sinless nature (Sura of Mary 19). Remember the many miracles he performed: he raised from the dead, healed the paralysed, the blind, the dumb, and cleansed the lepers. He cast out demons, stilled the storm, fed thousands of people with five loaves and two fishes. In the end, while his disciples were looking at him, he was taken up into heaven from among them. He never reproached those who worshipped him, accepting their worship as something quite normal! Is this not undeniable proof of his divinity? The late C. Lewis, world-renowned professor at the British universities of Oxford and Cambridge, was an agnostic and denied the divinity of Christ for several years. But after examining all the irrefutable proofs of the divinity of Christ with intellectual honesty, he submitted to Jesus as his God and Saviour.